NOTE See Exporting a Movie to learn how to use this feature. Windows Media Video (*.wmv): A movie format available on Windows only. QuickTime Movie (*.mov): A movie format available on macOS as well as Windows if Apple QuickTime is installed. Flash (.swf): A movie format that supports vector graphics and which can be embedded on the web. Jpeg (*.jpg): A sequence if images in a lossy compressed format. This format is faster to output and requires less storage space, but does not preserve image quality. Targa (.tga): A sequence of images in a lossless compressed format. Portable Network Graphics (*.png): A sequence of images in a lossless compressed format. PNG images require less storage space than TGA images and are commonly supported by Web browsers and consumer software. 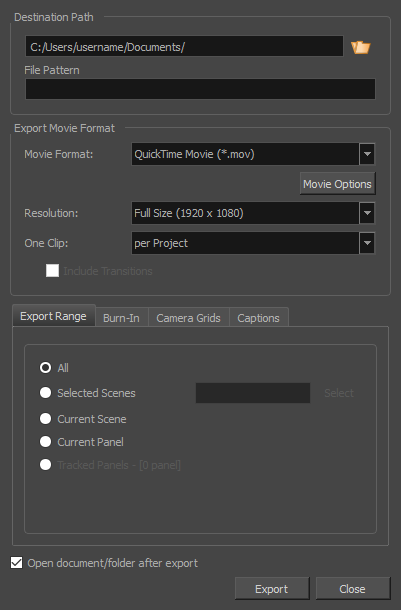 NOTE The option to export to Windows Media Video is only available on Windows, and the option to export to QuickTime Movie is only available on machines with QuickTime Player installed. When exporting in Windows Media Video (.wmv), QuickTime Movie (.mov) or Flash (.swf) format, this opens a dialog in which you can select video and audio compression settings for the movie files. Title Safe Area: Prints the Title Safe Area over the picture. By default, this area is 20% smaller than the camera frame. It is used as a guideline of the area that CRT displays might crop out of the picture. Visual elements such as text and logos should be placed within this area.The size of this area can be changed in the Camera tab of the Preferences dialog—see Camera Preferences. Action Safe Area: Prints the Action Safe Area over the picture. By default, this area is 10% smaller than the camera frame. It is used as a guideline of the area that CRT displays might crop out of the picture. Characters and action should be placed within this area. The size of this area can be changed in the Camera tab of the Preferences dialog—see Camera Preferences.